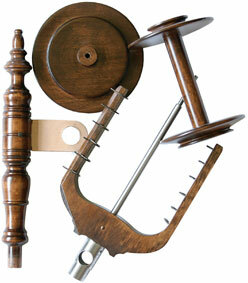 The Jumbo Flyer can extend the capabilities of your Kromski Minstrel wheel by adding a Jumbo Flyer Kit. You can quickly swap out your regular flyer for the jumbo unit (and back again). Here are the benefits: flyer with very large orifice .70 inch opening for heavy spinning and plying; much larger jumbo bobbin - holds 50 cubic inches of yarn; lower ratio ranges - 2 speeds - to give you excellent speed choices without changing flyer. For the Minstrel wheels the ratios are 4 and 5.3:1. Note 2: If the front maiden post on your Minstrel has a threaded rod out the bottom with a brass knurled nut to secure it to the mother-of-all base, please type "request old style of front maiden" in the "Comments" section of your order.